Every report comes with a selection of predefined data fields which can easily be added. You will also want to add a corresponding label to identify the information. A label is generally positioned in a Header section of a report, while a data field is positioned in the Detail area. 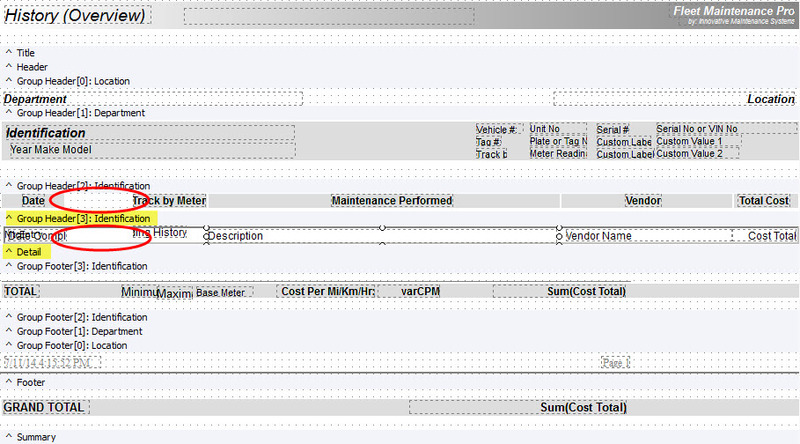 For this example, I will customize the History (Overview) report by adding the Work Order #. 3. Change the report layout from Portrait to Landscape to allow for more horizontal space. Click the Report menu and choose "Landscape. 4. 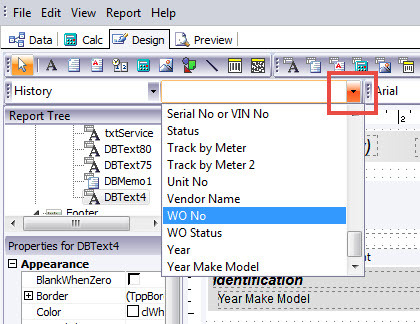 Adjust the size and position of the existing data fields to make space. To move a field, click to select, then drag it to the destination. To resize, hover your mouse over any circle in the border of the label until your cursor changes to a double-headed arrow, then click and drag to the desired position. For more precise adjustments, hold down your Shift key and use the arrow keys to resize, or hold down your Control key and use the arrow keys to nudge the position. You can multi-select to move or resize several fields at the same time by holding down the Shift key and clicking the fields; the circles surrounding the fields turn grey to indicate that they are selected. 5. After changing the layout and shifting the position of existing fields, there is now space in the Header area to add a new label, and the Detail area to add a new data field. 8. Highlight the text in the Edit Toolbar (it should turn blue) and type " WO #"
13. You can add a shaded background behind your label to match the rest of the report. Click the grey box behind one of the other labels and go to Edit > Copy, then go to Edit > Paste and reposition the box as needed. Lastly, right-click the box and choose Send to Back so that your label displays in front of it. If you wish to add a field that does not appear in the drop-down menu, you will need to have the Professional Version of the Report Designer Add-on Module.